1) Your Employer's Stock. Legendary fund manager Peter Lynch was always an advocate of investing in what you know and you are probably in the best position to know what is going on at your own employer. Moreover, any early employee at a company like Google who was given a large number of shares or who invested in shares on their own would no doubt be in a good position to retire early. On the other hand, many of Enron's employees had no idea what was actually going on within their employer's accounting department and had far too much of their 401k retirement plans invested in its shares - all of which they lost. And since you are also at risk of being laid off from your employer for any number of reasons not related to company performance, there is no need to increase your risk any further by holding a big position in your employer's stock. 2) New IPOs. Warren Buffet was an early disciple of Benjamin Graham, who warned in his investing classic, The Intelligent Investor, about investing in initial public offerings (IPOs) because they are intended to help a company raise money as well as reward early investors or insiders by allowing them to cash out with a profit. As I have written here before, wait 6 to 18 months for an IPO to prove itself. Even if the stocks price surges initially it will eventually pullback, form a sound base and move higher if the earnings and sales are strong. 3) Penny Stocks or Very Small Cap Stocks. There is nothing wrong with owning a few individual small cap stocks or an ETF or fund that invests in stocks with market caps of under $2 billion. After all, many large cap stocks started out as small cap stocks while small caps have been among the best performing equity classes. However, you should always avoid investing in any so-called penny stocks or microcaps which usually trade on the over-the-counter (OTC) market for a few cents a share. I never buy for my client or personal accounts stocks that are priced under $10 USD. Penny stocks are often not up-to-date with their SEC financial filings and are notorious for being volatile because they tend to be the subjects of paid-for promotions or investor relation campaigns where a stock is given considerable attention before new shares are issued (thus diluting existing shareholders) to raise funding or for certain big investors or traders to make a profitable exit. In the worst case scenario, it might be an illegal pump and dump scheme where you are left holding virtually worthless stock. 4) Commodity or Currency Futures. Back in the 1990s, Hillary Clinton gave cattle futures trading considerable attention when it was revealed that she turned a $1,000 investment into nearly $100,000 before she stopped trading after just ten months back in 1979. And while you don't need to be the First Lady of Arkansas to make a considerable amount of money in a short period of time trading commodity or currency futures, Hillary also managed to avoid margin calls even when she made wrong bets using leverage and owed her broker money. Don't assume you will be as lucky because its the heavy use of leverage that usually causes traders to experience margin calls and to loose more than just their initial investments. 5) Annuities (Especially in Tax-Differed IRAs). There are instances where investing in annuities can make sense, namely if you think there is a very good chance of outliving your savings. However, it never makes sense to put a tax-deferred annuity into a tax-deferred retirement account plus annuities are usually a good way to reward your financial advisor with hefty commissions when there are much better investment choices out there. I believe that history does indeed repeat itself. What was true in the past is most likely true today and in the future. Sure the events and names of companies change but general economic principles apply. When it comes to investing, one of the most important things for investors to understand is long-term interest rates. One must remember that you can lose money by investing in bonds if you do not hold the bond until maturity. You see, as interest rates rise, prices come down. As prices of bonds rise, interest rates come down. Bond prices and yields have what’s called an inverse relationship. For traders that understand this correlation, it can also be applied to stocks and bonds. When investors are feeling happy they buy stocks and sell bonds. If there is fear in the marketplace, investors dump their stocks and go into bonds for their safety. 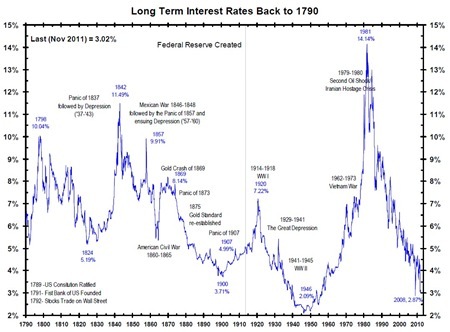 Interest rates have come down as the US Federal Reserve cut interest rates as far as it could and instituted quantitative easing (QE) to bring long-term interest rates down even further. However, the Fed has started scaling back QE and has indicated that it will likely raise interest rates next year. The other thing that you can tell from the chart above is that interest rates trend. In other words, when the Fed starts cutting rates, they keep cutting. Conversely, when they start raising rates, they keep raising. So it’s not a matter of question of if rates are going to start rising, but when. What that means is that bond prices will come down as rates rise. This has bond fund managers like Pimoc’s Bill Gross nervous. The great 25 year bull market in US Treasuries will finally come to an end and it will be harder for bond fund managers to make money. The good news for stock market investors is that there’s a lot of pent-up money sitting in bonds that will be looking for a new home. What we’ll see is the great migration of money out of bonds and into stocks. This is what a lot of people are missing about why the stock market will continue going up. There are literally trillions of dollars sitting in US bond funds. As investors reallocate their portfolios, they will reduce their bond fund holdings and boost their stock market holdings. This fact along with the technology revolution has me really excited about the stock market for the next 20 years. This just leaves one critical item remaining - what are income investors to do? Besides bond funds, one strong sector that has performed quite well over the past few years for income investors has been real estate investment trusts (REITS). As my clients and readers of my columns know, I’ve been a big fan of the Vanguard REIT ETF. It has averaged 9.29% annually over the past 10 years and pays a 3.7% dividend yield. The problem for REITS is that as interest rates rise, it makes it more expensive for them to borrow money and buy real estate. Since rents can’t go up as fast, that means there’s less money for REITS to distribute to their investors. This will likely reduce the returns investors get from US REITS. The solution is for investors to look at overseas REITS, particularly in Europe and Asia. Today, markets like Japan, Australia and Europe are unlikely to raise their rates any time soon. That’s why I’m steering my clients out the Vanguard REIT ETF and into the Vanguard Global ex-US REIT ETF. It offers all the protection and security of the Vanguard name, but gives investors exposure to property markets outside the US. It’s important for investors to realize that rising rates are a near-term event. In other words, investors need to start preparing for it and adjust their portfolio accordingly. As always, feel free to give me a call, email or Skype and we can discuss how rising interest rates can affect you. Each year, I head back to the US to see my mother and meet with clients. It also allows me to see how things are going. I need to do this to see if there’s any truth to the headlines I read. You know the ones I’m talking about - stocks in a bubble, economic slowdown, unemployment, etc…. Well, from what I saw, things are humming along just nicely. One day, I took my mother and bought her a new car at AutoNation Toyota. Across the street was a CarMax dealership, and we were able to sell her old car for cash. We did this all in one day and the process was so quick and convenient. I asked the salesman at both places how business was and the response was that it’s never been better. This was evident when I looked at the shares of AutoNation and CarMax. CarMax is up over 40% in the past year and AutoNation has risen over 20%. One factor driving automobile sales is lower gas prices. Lower gas prices are an instant pay raise for the US consumer. That’s why both AutoNation and CarMax are busy. Analysts expect automobile sales to rise 2.6% next year to 17 million vehicles. The average transaction price is expected to increase 2.4% to $32,589. Both companies are outperforming their competitors. They have sought to take the haggling aspect out of buying a new or used car. Their focus is on rock-bottom prices and moving inventory. They’re not like the typical car dealer where you spent all day at the dealership trying to get the price down. By having a limited markup, they sell more cars and make their money in the service department. It’s a sound business model and it works. What I like about both companies is there’s plenty of room for growth. AutoNation operates in just 15 states. CarMax has just 131 used car locations and plans to open 10 to 15 new locations each year. I don’t know about you, but I like owning a company expanding by 10% a year. It’s not just the consumer driving the US economy, but businesses as well. US corporations have made record profits. A lot of this money is going to improving their IT backbone and infrastructure. Two companies that are really benefiting from this trend are Oracle and Red Hat. Of the two, I really like Oracle. Oracle was founded by Larry Ellison, who is now the third richest man in America with a net worth of over $55 billion. He serves as the company’s chief visionary while Co-CEOs Safra Catz and Mark Hurd run the day-to-day operations. Mark Hurd was the former CEO of Hewlett-Packard and is considered one of the sharpest managers in tech. Safra Catz has worked with Larry Ellison since 1999. You know, many investors fail to look at management when it comes to investing. Warren Buffett has famously said that he would rather own a poor business with good management than a great business with bad management. Oracle has one of the best management teams in the world and the results speak for themselves. Last month, shares of Oracle jumped over 10% after a strong earnings report. Oracle expects revenues to come in strong for the next quarter and shares look to be setting up for another bull run. This optimism has traders, investors and the big institutions looking for a sure thing. A business making consistent profits like Oracle will keep making new highs. It’s not just investors buying shares of Oracle, but also Oracle itself. Every three months, Oracle is spending about $2 billion buying back its own shares. This takes shares out of the market and helps drive earnings per share. This is why I buy good quality companies like CarMax and Oracle. They have strong businesses and make plenty of money. As a result, their share prices keep going higher. As I tell my clients, it’s much easier to buy a stock that’s going up versus a stock that’s going down. It may sound simple, but you’ll be amazed at how many don’t follow this advice and instead buy companies at 52 week lows. What most fail to realize is that the reason those stocks are at new lows is because their business is broken. Margins have been squeezed and competitors have eaten their profits. Don’t make these classic mistakes. The trend is your friend and don’t fight the trend. Instead, give me a call and let’s talk about the market and how you can profit in 2015.